Habakkuk 3:17-19 Fig trees may no longer bloom, or vineyards produce grapes; olive trees may be fruitless, and harvest time a failure; sheep pens may be empty, and cattle stalls vacant--but I will still celebrate because the LORD God saves me. The LORD gives me strength. He makes my feet as sure as those of a deer, and he helps me stand on the mountains. One thing I love about going on mission trips is meeting new people. As we travel across the US and Mexico we meet people from all walks and stages of life, of all ethnic backgrounds and cultures and belief systems. Many people we only meet once. For a brief moment, our paths intersect and we have a once-in-a-lifetime chance to have a positive impact on a person's life. This is Nicolasa Martinez Reyes. She sells radishes. She goes barefoot, because shoes make her slip and fall. She and her husband Rocindo have 6 kids and more than 30 grandkids. Although she thinks she is ugly and dumb, she is a beautiful and intelligent woman. She speaks two languages fluently. When she smiles, her eyes sparkle and shine, and you can't help but smile with her. She loves Jesus and is looking forward to heaven where her knees won't ache anymore. Nicolasa has learned the art of making that one intersecting moment count. It's easy to get caught up in the busy-ness of life and forget to really enjoy it! I pray that I can follow Nicolasa's example and be a person who encourages others to enjoy this journey called life. January mission trip -- was amazing. Lots of hours in the car, but lots of blessings along the way! Keala wrote a great article on her blog about a couple of things we did on this trip. You can read it by clicking over to her blog Following the Way. We've begun teaching Bible Pathways in several areas and will be returning to continue teaching the course in the months to come. February -- Pastor's Retreat in Alamos, Sonora. Twenty pastors and their wives participated in a refreshing weekend full of good teaching and great fellowship. Thanks to the Church in Washington and to everyone who contributed and prayed to make this event a reality. While the parents were in Alamos at the retreat, the youth were at our house in Las Glorias hosting a Bible camp for the kids of the pastors. What a great team of young leaders we have!!! Harper Church from Port Orchard, Washington, sent down a team to help with the pastors' retreat and several other projects, including a Valentine's Banquet -- which was also a whopping success -- and a kitchen remodel (which isn't finished, but it's well on its way!). Said goodby to Hailey, our missionary from California who returned to her family at the beginning of March. It felt like sending another child off to college! Said hello to Keala's family who came to visit from Michigan for a week. We got Andrew's and Evie's temporary residency! Interspersed among those major events are the normal "day-to-day" events -- weekly Bible studies and classes, sharing at churches, youth group, softball, school, life. We've also added another weekly event in Guasave helping Pastor Braulio and another church with a new mission reaching out to youth in the city. It's busy and full, but it's the life God has called us to and we love it. 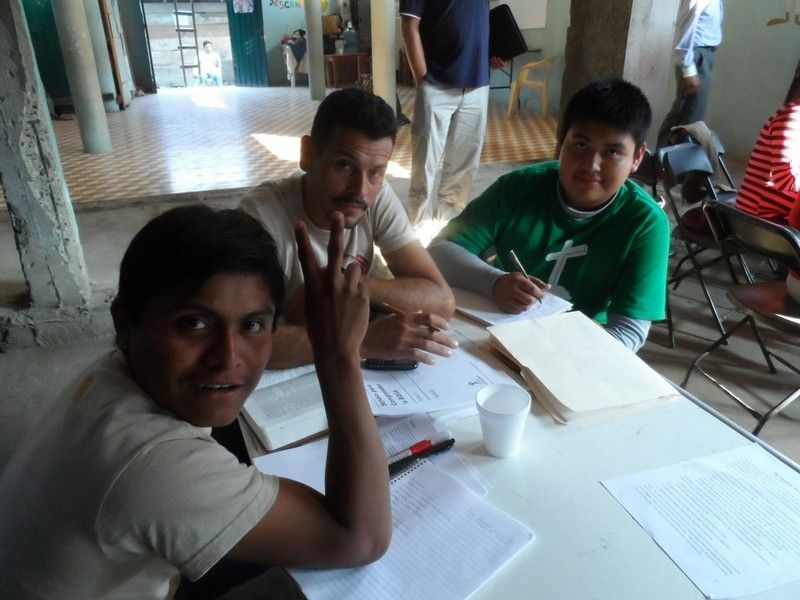 This photo of Jeremias, Tino and David was taken during a Bible Pathways class in Patla, Puebla, in January. Jeremias received a phone call a couple of weeks ago informing him that his aunt in Veracruz had passed away. When we asked him if he thought he might want to go to be with his family, he said he wasn't sure that it was God's will. Within an hour, friends from had Tucson offered to help him get there. When we told him, he admitted with tears in his eyes that, yes, he wanted to go. He hadn't seen any of his family for almost a year and this aunt had been like a mom to him, since his mom died when he was very young. So, Jeremias flew (for the first time ever) to Veracruz to be there for the funeral. His presence was a bright spot in many ways during this difficult time, because his family recognized the changes that God has been making in his life. We're glad to have him back helping in ministry and continuing his discipleship here in Sinaloa. In June, Jeremias will wrap up his first year of training by traveling south with Doug to present the second module of Bible Pathways in several locations. At that time, he will most likely spend a couple of weeks with his family again. Continue to pray for Jeremias and Jessee as they work with Joaquin and Doug in the carpentry workshop and as they reach out to men in Boca del Rio and the surrounding area. They have been discipling a group of about 10 youth from the area and we are seeing good fruit from their labors! Continue to pray for strength for them and that they would be faithful to their calling. Church services in Las Flores are often held under a tree at one of the church member's houses. 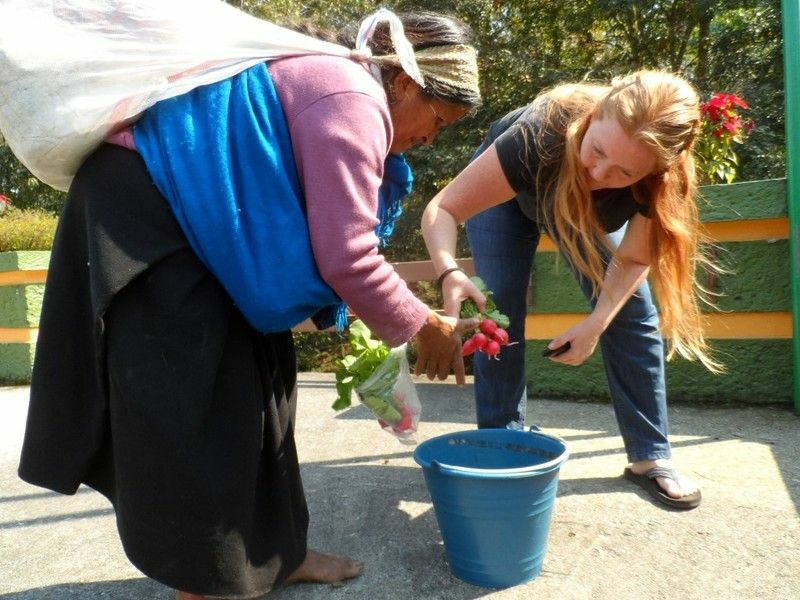 To kick-off Semana Santa (Holy Week), we are planning a two-day outreach in Las Flores. All of the surrounding villages have been invited to participate in the events of the day, which will include a youth soccer tournament, soccer clinics, life-skills workshops, family and child counseling and will culminate in a time of Bible teaching in the evenings. Braulio and Pily are very excited about the momentum that has been gained during the past months. They are seeing more and more interest in God in the village and people who have wandered away from God are beginning to return. It's very exciting! This is Pastor Narciso, Maria and their kids, Samuel, Jonathan and Catherine, in front of the church building in Quimichis, Nayarit. We were able to spend a few days in Quimichis this past January encouraging the body there and being encouraged by them as well. We are looking forward to our next visit, and will hopefully be able to spend more time with Pastor Narciso and his family. In July Jonathan, Narciso and Maria's son, will be graduating from Junior High. We've been invited to accompany him at his graduation, which is quite an honor in this culture. We feel privileged to be counted as family to this young man and are looking forward to seeing what God is going to do in his life! 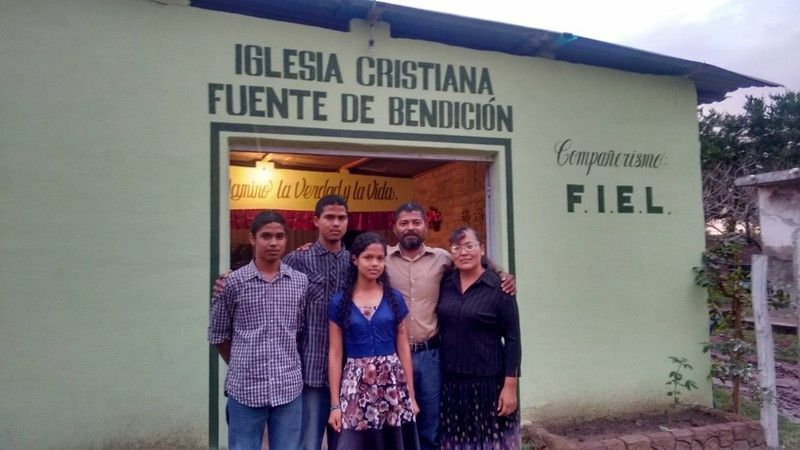 Keep praying for the Canseco family and for the Church in Quimichis, Nayarit; This is not an easy area to be in, spiritually or economically, so pray that they would be encouraged and strengthened in the love of Christ. Pray that the Church would be united and that the people of the village would repent and turn to Jesus. Ricardo and Cristina and family on the beach in Las Glorias! Although their son, Jaziel, was born in Sinaloa, he didn't remember the beach. He was so excited to finally see the ocean! 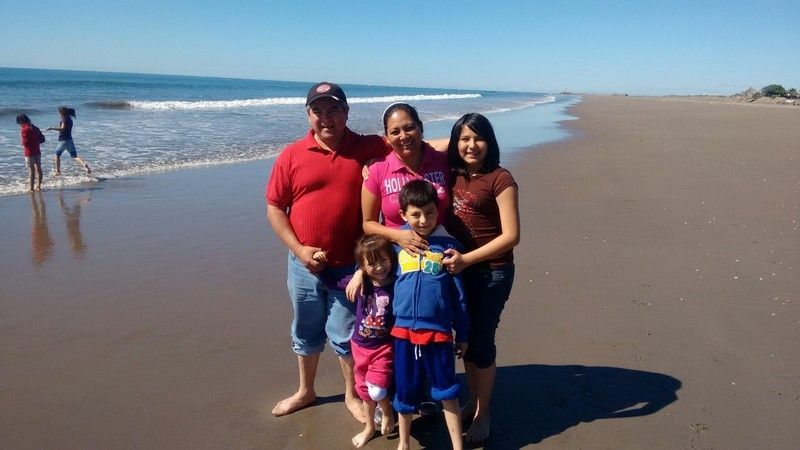 In February, Ricardo and Cristina brought their three children up to Sinaloa to visit. It was a wonderful, refreshing time for all of us! They were able to attend the Alamos Pastors' Retreat which we hosted with the Washington mission team and then spent a week visiting with us and with other friends in Boca. In June we are planning a trip to Celaya, Guanajuato, to scout out locations for Ricardo and his family to start a mission. That area is in the heart of the "Circle of Silence", which is a part of Mexico with over 2 million people who have never received a clear presentation of the gospel message. Pray that God would speak to us and direct us as we visit these areas. Cristina also shared that they are prayerfully considering homeschooling their kids in the coming year. Pray for wisdom and discernment in this area and also that if that's God's will for them, He would also provide a support network in the area in which they will be living. Here is most of the FLOWinternational team. It's hard to get everyone together for a photo when people live so far apart. Fabian and Sarah have returned from their honeymoon. The wedding was a smashing success, and we had a fabulous time with all the friends and family who traveled from far and near to share this epic event with us. It was by far the biggest event we've ever planned and pulled off, but it was also the most relaxed and stress-free event we've ever hosted. Of course, it had moments of tension -- like when the rings went missing and when the "caterer" called and said they had no way to transport the cauldron of stew -- but everything worked out beautifully and...they are married! Our best guess is that there were 400 people in attendance. It's hard to say for sure, but it was somewhere around there. Now the newlyweds are settling into life in Alamos, Sonora, where they will be serving with the Calvary Chapel church. Pray that God would continue to direct them and help them adjust to life as a unit, instead of as individuals! 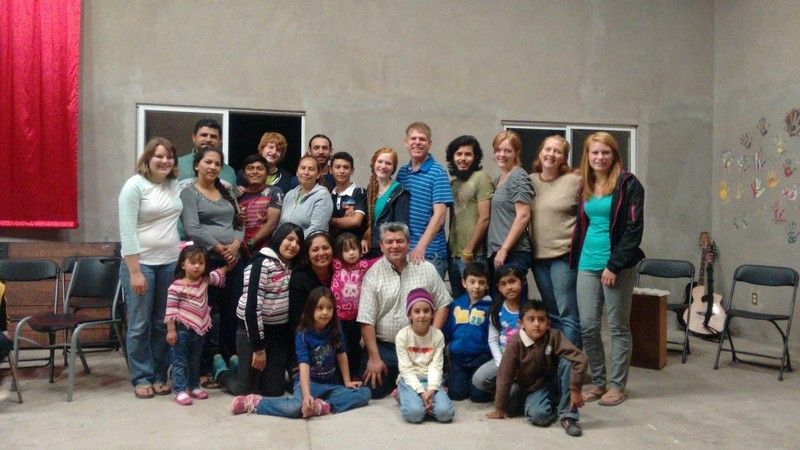 Pray for them as they enjoy this new season and also as they set their sights on lost souls in the Sonora and Chihuahua mountains. They will be a lethal weapon against the evil and oppression of the enemy in those regions. We're so proud of them and are super-excited to be partnered with them in ministry. Please be in prayer for the outreach this weekend and for the Church in Las Flores. Also pray with us that God would provide a dependable car at a good price for Braulio's family and ministry. We are planning a baptism on April 5. Several of the young men are praying about making this decision, but one man is certain: Ramon (the Cowboy) Miranda. We are so excited that he's ready to take this step of obedience! We believe that God is going to do some amazing things in his life and in the life of his family. Pray for the Miranda family (it's HUGE!). Praise God for His faithfulness during the process of acquiring temporary residency for the kids and us. It's been quite a process with lots of roadblocks, but we now have residency for Andrew and Evie and for Doug and I. Hurray!!! Pray for Pedro. The past 6 months have been very up and down in his walk with God. Pray for strength and for wisdom as he fights against addictions and deals with the consequences of sin in his life and bad decisions he's made. Pray for his family as well and that they would be supportive and encouraging and not lose faith during this struggle. 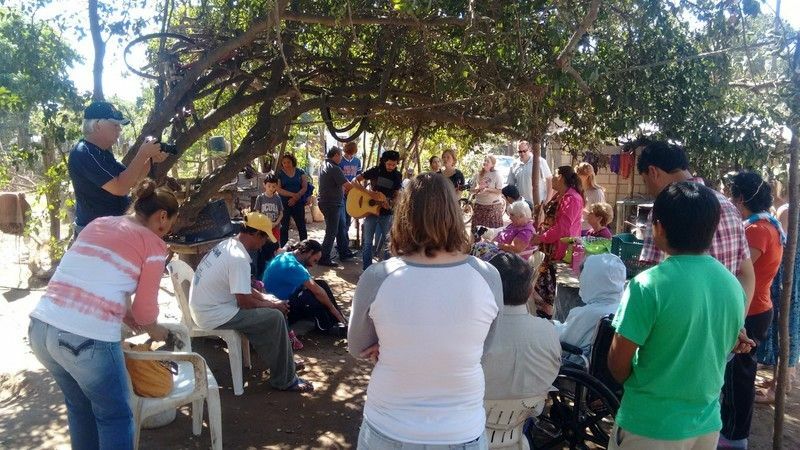 Pray for the Church in Las Glorias and Boca del Rio during Holy Week. We're expecting an enormous amount of people to visit our area during that week. Pray that the Church would be able to be effective and relevant in the lives of people visiting and that Christ would be glorified during the week's activities. It is easy to become distracted when there is a lot of activity, so pray that we can remain focused on things that are of eternal importance and not so much on things which don't last. Pray that God would be guiding us as we prepare for another trip to central and southern Mexico in June/July. Pray for us as we prepare for a quick trip to the States in April. We'll be traveling from April 9 to about April 28.